You came through with tons of feedback on the question of the embroidered “scales” on the hummingbird’s chest that I showed you the other day! Thank you – I do love reading all the ideas! At this point, I haven’t put any idea to the test yet, though. But I have worked the hummingbird’s neck, and it might terrify some of you, especially if you’re opposed to the brighter blues. It features a bit of texture, and I’ll just admit it now… I like it! Here it is, from a slightly distance. You can see that I haven’t taken the dark threads off the chest feathers yet, but I definitely plan to remove those emerald green outlines. On the neck band, I worked a ribbed web-like stitch, only in lines rather than around a circle. I used one strand of regular cotton floss to stitch tiny lines perpendicular to the neck band lines. Then, I wrapped those tiny little bars in the same technique used for the ribbed spider web stitch, to create a bumpy band on the bird’s neck. I used the same colors of brighter blues that are found in the facial adornments. This whole adventure was a little tricky, because that area is a lot smaller than you’d think when you’re looking at it in a photo like this. It’s only about an eighth of an inch wide. The wrapping of the straight stitches was done with one thread of regular floss and a #28 tapestry needle. The tapestry needle was essential. I was already working in close quarters, and the fine tapestry needle with the blunt tip made it at least somewhat easier to wrap the straight stitch bars without snagging all the surrounding threads. If we step back a bit, it’s easier to see the size of the birds in relation to the surrounding flora. The different elements of the bird – the head, the neck band, the chest – are a lot smaller when seen in context, rather than up close in photos. That’s one disadvantage of close up photos – it’s easy to lose a proper sense of proportion. Here’s one even farther away, where I tried (but failed!) to get the whole design in the frame. While the head does look a bit limpid at this point, keep in mind that the beak is still to come, and it will further define the head, especially right above that blue and purple neck swash thingamabob. I’m eager to re-work some of the chest area now and see what develops! So that’s my next step…. 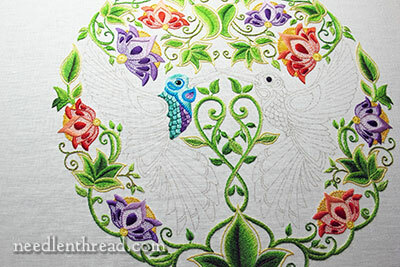 Again, all thread colors will be listed once I finish the bird, just in case I make any major color changes. Who knows? I still may end up scrapping the whole bird and starting over again! If you have any thoughts or impressions, feel free to share them below! Thank you for putting up the photo with a bit of distance, it does bring it into a better perspective. I think the emerald green outlines just need a bit of lightening up, or maybe a complete change of color to shake things up. This whole project is going into a deliciously rich direction! 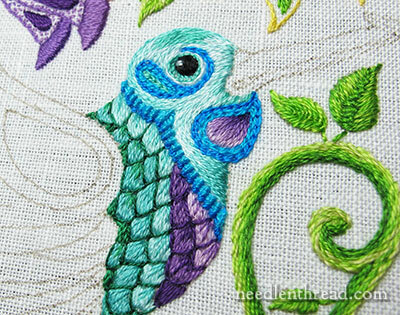 I think it is the variety of colors in embroidery that I love so much, that and the textures of the stitches. The ribbed spider web stitch has been a big help for me in the past, I really like that stitch. Lovely!! Possibly by the time the wings are worked the colours used for the breast feathers will fall into place. That new band of colour has made quite a difference. The only change may be slightly lightening the fly stitch? I am enjoying following your thought processes and seeing this part of the project develope. The “Secret Garden” project is fabulous; just wish when you complete it, a dvd would become available . I feel I shouldn’t be commenting when I am not getting the feel of what you are aiming for, but I do feel that the chest does look more like scales rather that feathers and do not care at all for your neck band, want it to be a more flowing line, perhaps this will be balanced when the rest of your bird is complete, but get the feel that the head and chest are so busy, it would be hard for him to take flight. Wouldn’t comment unless invited, all the embroidery is gorgeous – thanks. I’ve loved following along on this beautiful hummingbird adventure. You are such an artist and you are bringing it all to life. It is wonderful to watch it happen. I agree with you on removing those darker lines on the lighter portions of the “scales”. Also, I don’t know why, but the hummingbird looks like it has a wattle and it is driving me crazy! I think he needs a smoother neck line. My 2-cents worth! Thanks for taking us on this journey. I look forward anxiously for progress on this gorgeous piece every day! Yep – it’s definitely stylized, and that’s part of the original drawing. It would be impossible to remove it at this point, since I transferred it as drawn. So, the neck thing stays…! You could try the same stitch on the chest, but vary the size of the squares. Just wondering… why not long and short using the same colors that you have, just for his chest? Once again, I’ll say that the colors are just divine….and I so like the way the hummingbird will contrast the flowers at the same time as all the colors will work together. The thing that I notice is the texture, texture, texture in this hummingbird. While we can’t duplicate nature exactly, and really don’t want to do that, my impression when I see one of these lovely creatures is one of fluttering irridescence……..texture never strikes me as much as the subtle delicacy of the colors…..never being quite sure where one color ends and another begins……that being said, I am not sure at all how this could be conveyed by thread…..except by maybe interspersing them, or, in an appropriate situation, using 2 colors at once, if the project allows. I am looking forward to seeing this gorgeous work complete! I think you should take the emerald outline out for sure. It’s too dark. Considering you did not shade or outline any other element with a darker thread, this is too heavy for the rest of the piece. I think a simple voiding would work: when one element shares the hole of another, thus creating a small void and separating each design element. Failing that option, a thing I do often is to split stitch a slim shadow line using either black or a dark colour in a fine thread. Then I split into this split stitch line. This helps to create definition. I really do think though that the void would be sufficient in your project. Mary, This is magnificent. I hesitated to write yesterday but decided to do so today. Were the piece mine I think I would like to see a bit less definition in the breast of the bird. The breast of a hummingbird is so beautiful because it is so sleek and I think that element is missing as it now is. My thoughts would be to do your gorgeous long and short stitch on the breast utilizing all the colors that you now have there, but blending them so that the whole effect is very nuanced and I think that may make the breast look more like feathers. Good morning, Mrs. Corbet. I do not see how you can possibly be dissatisfied with any part of this Hummer. He’s PERFECTION! I really love the Emerald outlining and really truly don’t want to see it go. I love the neckband, I love the head, I LOVR THIS BIRD! He really needs a name. I know that you have to stay true to yourself, so I respect any alterations you will make. I just really need you to know that there are two people (me and mom) who this everything is wonderful just as it is! It’s stunning! The texture adds a lot to the overall look. I do not like the outline on the chest feathers. I waited to see the neck band,( I like that ), before commenting & I still do not like the outlining. For me, the color change is enough. I do love the colors you are using. Mary, don’t rip out the chest outlinig until you see what the color in the wings are going to do. When you filled in the neck the chest didn’t look so glaringly wrong. You may find you need it for color balance. I love what you have done with the whole Embroidery piece. I looked up the Humming bird Picture that one of the girls put on your comment page yesterday. And you could see the colours and how the feathers laid they looked like scales. And very vivid colours he was beautiful. took this out of is full of these designs which look really fantasy like. I think the author would love to see your piece and what you have done I think she would love it. Seeing the whole piece makes such a difference! The colors on the bird work so well with the whole. Well, except maybe for the emerald green outlining the feathers. But the dark green along the bottom edge of the feathers is perfect. Can’t wait to see what the wings will look like as their size makes them a pretty important part of the whole. They will really stand out. I like that the bird is so stylized as the flowers are also. If he was too realistic he just wouldn’t fit into the overall design. I always get excited about colors so I love this project! For what it’s worth – I’d leave it alone. I was wishy washy about the scales until I saw the entire piece and now I feel they fit right in – including the dark green edging (shadows?). I’d like to see what happens to the whole thing when the wings are put in – every additional section realigns the first and takes away or accents the color/stitch choice (as you know). Just my 2cents worth (and maybe not worth that). This is such an interesting project. I love following the thought processes. I’m having just a little problem with the neck area. He looks (to me) as if he has a goitre. I can’t seem to get past it. I keep feeling a need to swallow. Looking forward to the next update. I love the ribbed web-like stitch I suppose you put in straight lines and then filled them up I love it, I must remember this for future reference, in fact I love the whole colour, thread and stitches it’s really coming together. The photos you’ve taken at a distance really show how lovely the the whole design is the different coloured flowers and the green of the leaves and now the the Hummingbird it’s really refreshing and I think a work of art, lovely. Thanks for sharing this with us. I admit I am anxious to see the beak added. Keep up the good work. I’m loving this bird already. I really loved the dark green accents on the neck ‘scallops’ … but did Not ike the purples on the breast. I love the project as a whole, but am not enamoured of your colour choices re the flowers – I’m really sorry about that, but you did ask!!! The stems and leaves are gorgeous. If I had the skill and the nerve to take up this project for myself, I would have chosen much paler colours for the flowers overall, and let the hummingbirds dominate. I am fascinated by your stitch choices, the variety brings splendid texture to the piece. You are a wonderful teacher and inspiration, especially for us beginners. Many thanks. Before ripping out all the emerald I suggest trying an extra staggered layer of stitches overlapping adjoining edges. The edge would exist but be slightly blurred. Since humming birds are iridescent one of your warm colors might work. I love the blue! And I love how you stitched it. Once the dark green is off that neck is going to look FABulous dahling! Just FABulous!!! would be more pleasing to the eye of the beholder. The original outline could be maintained just the direction of the stitches changed. I think the neck line brought it all together – I would not touch anything until the head (with beak) is done. It is a stylized bird after all! The “scales” are going to be less noticeable once the rest of the bird body is going to be finished in this very vivid color panel. Overall Mary, you did magic with the colors! I love how Kathryn from Yorkshire put it. Keeping all in perspective his “thingamabob” will lay down nicely once the strength of the beak is there. The explanation of these stitches and how they are decided pushes me to practice my stitches with more discipline. Thanks so much Mary, this is a study I am so glad to be able to follow. How about trying shades of the blue (royal?) 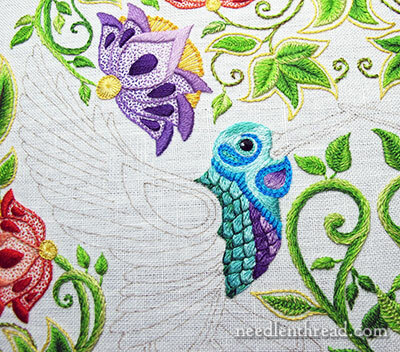 you used in the neckband to outline the blue/green feathers? I love the head and upper chest so far! I love the way you did the neck band and I can’t wait to see it when you “de-scale” it! I think the neckband looks good, like it fits in. Your bird looks very nice Mary and I look forward to seeing what you ultimately do with the chest area. I like your treatment of the throat collar and am off to try that method with my own colors. Thank you for such a fun project. Please don’t remove the outline stitches on the bird’s neck!!!! If I understand you right that is. To me, that’s what makes it, absolutely. This bird is awesome, as is the whole thing. Keep up the good work, and thanks for keeping us posted as you go. I enjoy your website like no other. BTW, the video tutorial for the outline stitch has no video, only audio. I’m using that stitch quite a bit in my work, and I want to make sure I’m doing it right! Looking at the bird from a distance is far more helpful for considering the colours, I do like the textures the different stitches make. I agree that the emerald fly stitch is to “definite” perhaps using a grey blue, grey green and a straight stich that some how goes under some of the stitches so that it becomes spatially hidden. Or nothing at all and relying on the texture for definition, next bird could do the outline before the filling. Another consideration for a little later on is picking up the reddish orange from the large flowers for a tiny underclass colour somewhere under the bigger wings or body. A lot of your readers are checking out the photo of the real hummingbird as it is “trending” on-line. Looks like you have set up a minor ripple in the universe!! I’m enjoying watching this develop! btw, in hummingbird circles, the neck patch thingie is called a “gorget”. For a purple one in real life, see photos of the black-chinned hummingbird. Love the “step-back” view. The vivid blues seem necessary. Otherwise, the birds would be lost against the vivid flowers. Besides, I love the colors. While I admit there is a scale-like quality to the neck feathers, I hope you only tone it down, not remove the definition that is provided. I am new to your newsletter and can’t tell you how much I enjoy each day’s letter. Fun to read and so informative. Thank you! I purchased two of your recently recommended books and am very pleased with Shelagh Amor’s Crewel Embroidery and the Little Flowers book by Nickerk and Zherdeva. Oh Mary! So much to do in such a tiny space…and it ALL matters! Anyway, you’re really doing a wonderful and thoughtful exploration, and it’s very brave of you to let us see into the process…I somehow want to see some ‘ruby’ on either the throat or the chest. There’s some marvelous images on Google of hummingbirds with virtual rainbows plastered across their breasts…so don’t be shy on this one…Mother Nature certainly isn’t! I like the chest feathers. Thank you for the stand-back view – seeing the bird in its context makes a huge difference. I really like the neckband, and it softens the scale effect of the neck feathers – they look so much better now the band is worked. As you say, until you work the beak it’s hard to assess how well the head colouring is working. The “swash(? )” or gorget is what really troubles me about this piece. Enough so that I Googled “hummingbird gorget” to see some pictures of the real thing. After looking at real hummingbird pictures, I concluded that it really is a fantasy piece (both the bird and the flowers) and you should continue to do whatever pleases you. The fish scale feathers while not realistic are quite pretty. I would leave them as is. Not wild about the neck band but from a distance it’s effective. Will be interested to see how it all comes together. What a beautiful tableau! Your embroidery and choies of colour is as always stunning. Personally I think that your bird is beautiful as it is. But then again you have to be happy with it as it is your création and you see the colours according to your own préférences. Thanks for a beautiful blog and the générosité of sharing your embroidery meander with us all. We are all learning so much from you. Have a lovely day Mary. Thank you, Angela! I am glad you are enjoying it! if yooou look at it from a painting look it goes very well. Look at nature as such, it does look very good I like the colours. Could you recommend what needle type and size you are using in this project and if you use the same needle for the 2 strand stitches and the 1 strand for the long and short stitch. I use either a #9 or a #10 crewel for one strand, and a #8 or #9 for two strands. The #9 will work for 2 strands, depending on the fabric. If you’re using a really tightly woven, hard to get through fabric, a #8 is better. Thank you Mary so much. A pleasure to follow. I get it! Your ‘scales’ are pointy on the bottoms. When I checked the site about the closeup of the hummingbird, I was astonished to see that they really do have feathers there. BUT. They are shaped like upside-down scallop shells! Rounded on the bottoms. And would have to be worked from the chest to the head. I love your work, as you know… and also your colors. If they overlap, they won’t need outlining! I like the bright blues, but I really think those neck ‘scales’ look like scales. If I were doing it, I would have a more feathery look. I’ve been watching the hummingbirds in my yard, and they have a wonderfully feather neck. I’m with you, the outline around the chest feathers doesn’t thrill me, even in that lovely emerald green. But I go even further; I don’t like the idea of outlines there in any color. I love the shimmery smooth feathers of a hummingbird’s breast and would stick to the tidiest, most even satin stitches I could make. But I have to admit, in the 2 years I’ve followed your blog your results unfailingly overcome any doubts I had about any particular design choice. And I expect this won’t be any different. Hi Mary I might be a bit late with my tuppence worth, have been away. I think if you were to stitch the beak it would make a difference. 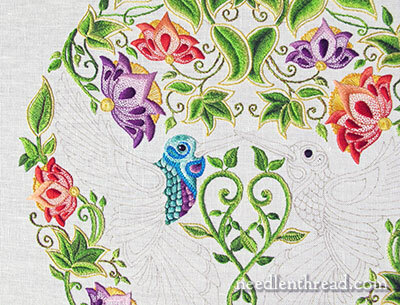 We would be able to relate the colors better to the fact it is a bird you are stitching and not part of the Jacobean Jumble. That is not meant to be derogatory. Next Next post: What Was that Satin For, Anyway?